Update 1/10/15: A*Sakura is closed. JM, Kristin and Nichole split the crab rangoon, chicken teriyaki dinner with soup and edamame, and a Sakura combo with a queen roll, a ninja roll, tuna sashimi, and two hand rolls (California and tuna). JM also had a lemonade, Nichole had a green tea and we received a lagniappe of fresh oranges and an extra soup. The bill was about $13/person, plus tip. JM, Kristin and Nichole all gave A*Sakura an A- (see our grading rubric). First things first. We had no idea on this early spring night that our dinner companion would soon be leaving for Chicago. Kristin, your writing is always a treat - fastidious in its attention to detail and rich in understanding and warmth for the subject, whether Reuben sandwiches or automated waste management systems - and we wish you the best, wherever your future takes you. You will be missed! And now, back to the show. A pretty saltwater aquarium is the first thing you see when entering A*Sakura. They (or their short-lived predecessor Sushi and Hibachi) made some changes to the former Caribou Coffee, but it turns out that a stone fireplace and tall windows are surprisingly fitting to both northwoods and casual Japanese decor. A pergola hides the ceiling now, dimming light and damping sound for a peaceful dinner experience. The furnishings were food-court quality, but care was shown in the way the places are set with skillfully folded paper napkins - and the small touches didn't end there. We started with clear soup; two bowls were included in our order but we were given three. The broth had a flavor somewhere between very rich chicken and mild turkey. Plenty of mushrooms and onions filled it out. More starters followed, including savory crab rangoon pinched into perfect points. JM's side salad had a bit too much ginger curry dressing (in contrast - maybe even response - to the experience in the WSJ review) but the edamame were warm and pristine. Each pod was a flawless green, and our only wish was that the table salt on them was something larger-grained. 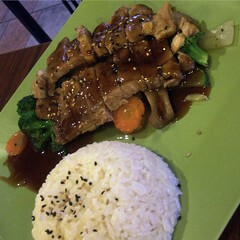 The chicken teriyaki was slightly sweet, with an almost maple richness that was surprising and tasty on both meat and vegetables. The side of rice was sprinkled with toasted sesame seeds. Splitting a Sakura combo ensures enough food for at least two people, though the surfeit of options can be daunting as we were faced with our choice of two pieces of sushi, two hand rolls and two chef special rolls. 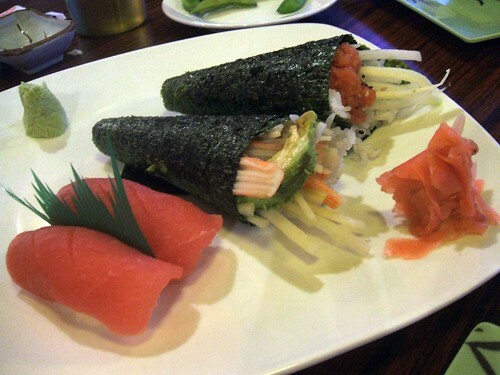 The first plate came out with the tuna sashimi and hand rolls. The tuna was very fresh, and the tuna hand roll quite spicy; the California hand roll had matchstick cucumbers and slightly past-its-prime avocado. The nori around the hand rolls was tough and snappy but not at all stale or unmanageable - perfect for mobile food, and made us wish we were walking on a boardwalk somewhere. 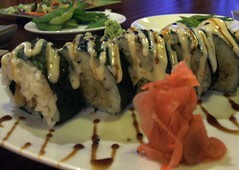 The second plate to arrive was the queen roll. Eight pieces of tuna wrapped around rice and topped with spicy mayo were paired into heart shapes that required us to split each in two to get a bite. We couldn't decide if the dish was more appropriate for a first or a last date. Kristin and Nichole couldn't resist the mystery that was the ninja roll, the ingredients of which were the only ones not listed on the menu. Should we spoil the surprise by telling you what was in it? Or maybe you've already had it and just didn't realize it? 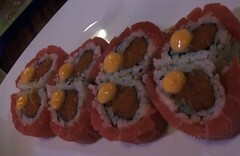 For the curious, it was tuna tempura - "vaguely reminiscent of fried chicken" - cuke, mayo, and sesame seeds. Dinner ended with a surprise that we hope is OK to tell the internet about, because we don't know why we were chosen to receive such a boon nor whether it's something that happens after every dinner. Three half oranges arrived, sitting in bowls fashioned from their own peels, sectioned, and speared with toothpicks. They were delicious and refreshing, and had a faint almond flavor. Bottom line, A*Sakura is well-put-together and conscientious. It's a nice place for very fairly priced sushi.